Kerala food at its best! 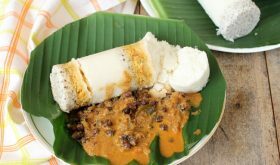 Puttu aka rice steamed cake is Kerala’s traditional breakfast that is usually served with Kadala (black chickpeas/kala chana) curry or moong dal curry. It is also relished with ripe banana, jackfruit or fish curry. 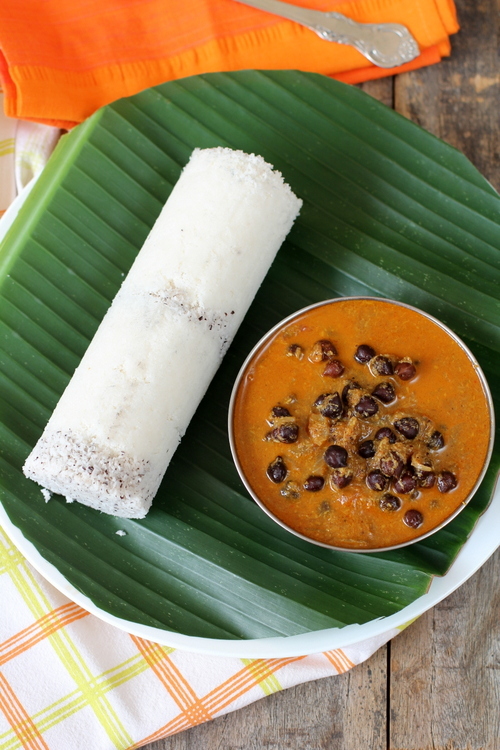 Puttu recipe calls for the use of coarsely ground rice flour and grated coconut. It is steamed in a metal puttu maker (a steamer in cylindrical or dome shape) though it can also be prepared with Idli plates or a coconut shell and steamed in a pressure cooker. Though traditionally prepared with rice flour, it can also be prepared with wheat flour, ragi (horsegram), oats or couscous. The key to soft puttu lies in the moisture content of the rice flour. You should not add too much or too less water. I found that adding almost 2/3 rd cup of water to two cups of rice flour works good for me. Many suggest using 1/2 cup of water though. When you take a fistful of rice flour and close your fist, it should take the shape of your fist as shown in the picture above. This is the right consistency of the rice flour and its ready to be steamed. 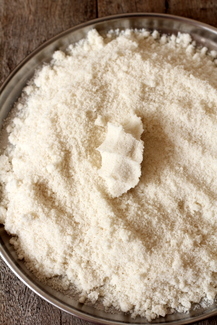 Rice flour can be prepared at home. Soak rice for 1-2 hours, drain the water and dry the rice on a cloth. Once dry, grind to a coarse powder. Roast this coarse rice flour on low flame for 4-5 minutes (mixing continuously) or till it is moisture free and slips off the ladle. Spread this powder on a plate and leave aside for a few minutes before storing it in an airtight container for 2 to 3 weeks. Along with the traditional style Puttu I also prepared an egg masala based one. In addition to grated coconut, a layer of scrambled egg masala is added to the mould before adding the puttu mix into the mould before being steamed. You can add kheema or minced chicken as well. In a large bowl, place the puttu powder. Add salt to taste to 2/3 cup of water and slowly add about 2 tbsps at a time to the puttu powder and mix it. Do not add all the water at once. It should be a bread crumb consistency and not form a dough. Add melted ghee and mix. Normally 1/2 cup to 2/3 rd cup of water is sufficient to wet 2 cups of puttu powder. The right consistency of puttu powder is achieved when you take the prepared flour in your fist and close it to form shape. Leave aside this prepared rice mixture for an hour or two at room temperature. When the mixture sits, water is absorbed. After sitting time of 1 or 2 hours, if you find that the mixture is slightly dry, add a little more water and mix. Add 2 cups water to the bottom vessel of the puttu maker and allow to simmer till hot. Wet the puttu mould and lightly grease it. Place the round perforated disc with holes inside the puttu mould such that it fits well at the bottom of the mould. Place 2 tbsps of grated coconut at the bottom of the puttu mould. Carefully and slowly pour about 6 tbsps of the puttu powder from a height followed by another layer of 2 tbsps of grated coconut. Again layer with 6 tbsps of puttu powder and finish off with 2 tbps of grated coconut on the top. Place the lid over the puttu mould annd place the mould over the water vessel. 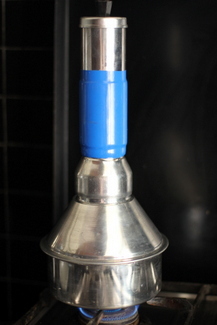 Steam on high medium flame for 5-6 mts and 4 mts on low flame. Turn off heat and wait for 2 to 3 mts before removing the puttu from the mould with the help of a wooden ladle or skewer. Hold the puttu mould parallel to the serving plate and with the help of a long ladle gently push the bottom disc such that the puttu slides onto the plate. Serve warm with Kadala curry or banana and pappadam. A tsp of cumin seeds can also be added to the puttu mix. Addition of ghee yields soft puttu. Once the puttu mixture is prepared, leave it aside for a minimum of half an hour to 2 hours. Once the puttu is steamed, remove the mould and leave it aside for 3 minutes and then gently push the finished puttu onto a plate. Store bought puttu podi/powder can be used right away. If using store bought rice flour, you need to roast it on low flame for 5-7 mts before using it to prepare Puttu. By Sailu Published: December 30, 2012 Kerala food at its best. 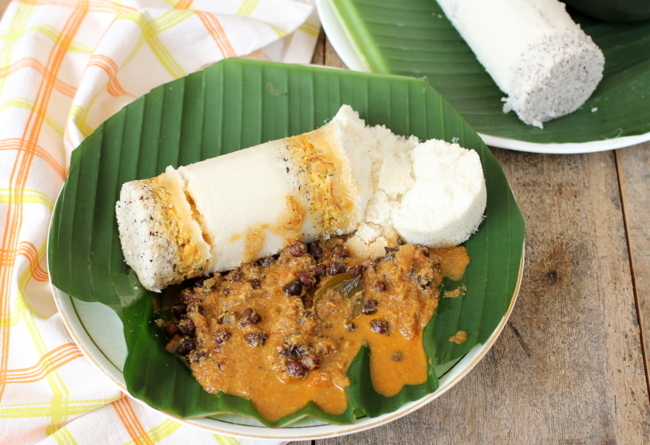 Puttu is a rice flour based traditional breakfast recipe that is usually served with Kadala (black chickpeas) curry or banana. Omg! It looks so perfect n yummy ! this has been a gr8 week. you are blogging new recipes every day!!!. thank you for that. Wao they look mouthwatering…I have never tasted Puttu…but love anything made out of rice! Puttu is a breakfast dish originating from the State of Kerala, eaten in Kerala, some parts of Tamil Nadu, Coorg and canara region of Karnataka, and Sri Lanka. Puttu or Pittu means “portioned” in Malayalam language. It is made of steamed cylinders of ground rice layered with coconut. 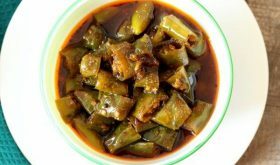 It is highly popular in the Indian state of Kerala as well as in many areas of Sri Lanka, where it is also known as pittu. Can I omit the coconut? If I do, do I need to make any other adjustments. I see most of the posts are from years ago. I wanted know when making putty can I omit the coconut. Do I need to make any adjustments when doing so? Any suggestions of a desert or snack I can make as a gift to give some one from Kerala? Thanks for any reply. Yes, you can omit puttu. You can add veggies of your choice, You can saute mixed vegetables like carrot and beans and spice them a bit and use instead of coconut. You can add meat or chicken too.